On (Canadian) Thanksgiving weekend, our son Etienne and his sweetheart Tash became engaged, to everyone's delight. Etienne planned the moment carefully, choosing to propose at her mother's country house. He prepared a thermos of hot chocolate, invited Tash for a walk, led her to the end of the dock, and asked the classic question-with-a-ring. We met for a shopping expedition a week before; associate Francine and owner Jeff of Daisy Antiques in Montréal had an enchanting collection. His budget went much farther, and buying vintage reflected the couple's values. Toward evening, revelers blew conch shells, a family tradition, as the sun dropped toward the lake and magnificent fall colours blazed behind them. Etienne's brother Jules, a butcher, made the boar-and-pork charcuterie served for hors d'oeuvre. 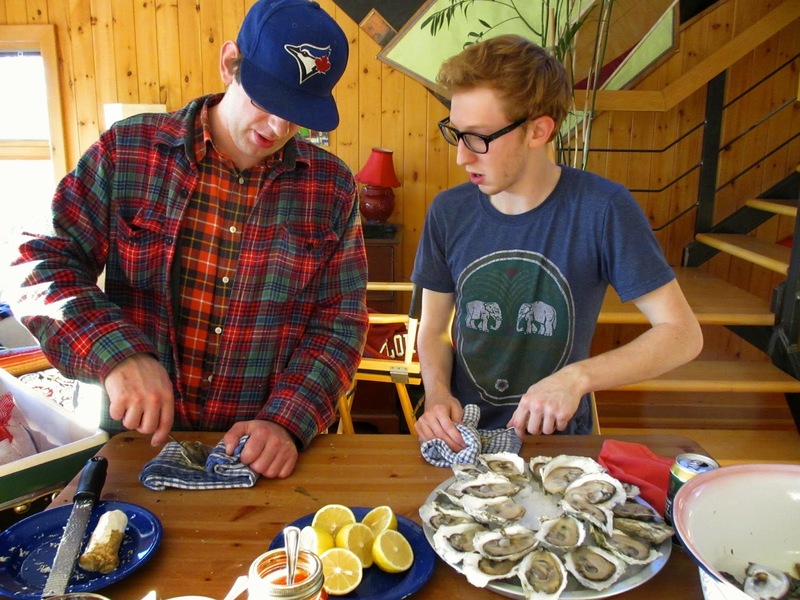 He's also a pro oyster shucker, so shucked Choice Harbour oysters with Tash's youngest brother, while wearing what Canadians call "The Kenora Dinner Jacket", double flannel plaid, Blue Jays cap optional. Sapphires are pretty; babies are precious! Congratulations to your son and best wishes to the lovely bride to be. What a wonderful Thanksgiving to celebrate! Such a lot to celebrate and be thankful for, Duchesse! My youngest son also became engaged three weeks ago with a wedding planned for next October. And I was convinced that he would hold out forever! He is engaged to a lovely Toronto lass and we are thrilled. Aren't we truly blessed? What wonderful news! And what a beautiful place, warm celebration, and delightful people to announce it into. Your family is blessed with this gorgeous new bride. Congratulations to your son! Congratulations to your son and his lovely fiancée. What a marvellousThanksgiving. Your thanksgiving sounds just perfect. The food looks amazing and how exciting that your son proposed with that gorgeous vintage ring. Congratulations to Etienne and Tash. So many wonderful things to celebrate on Thanksgiving! This all makes me a little teary, I must admit, as I suspect we may be hearing similar news in the near future. There is something about the sight of our young adults taking that step that is so touchingly beautiful. Ah, family happiness! Congratulations! So exciting! Beautiful couple, wonderful news. Félicitations à Étienne et Tash, et à vous tous. Enjoy this utterly splendid day! 24° and sunny!!! Congratulations to the lovely couple! And what a beautiful weekend it appears to have been. Love the engagement ring! Excellent choice for the beautiful bride-to-be. Congratulations, this is such happy news! Congratulations. I love the ring, beautiful choice. They're a great looking couple and since I love plaid, I can see I'll be wearing the Kenora Dinner Jacket ensemble often! 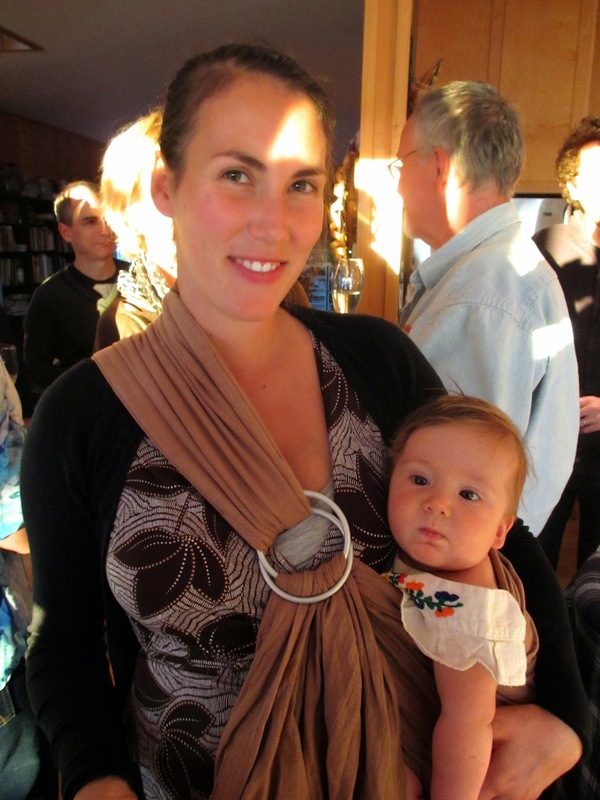 Congratulations to Etienne dear Duchesse, and many warm wishes to your new family member Tash -- so lovely and talented! What a lovely and memorable event, and I love the vintage ring -- chic and ecologically considerate. Awww... so sweet! Best of luck to the happy couple. Sounds like a lovely family celebration all 'round. A pretty ring your son chose, too! Seriously, it really was a memorable Thanksgiving! What a beautiful ring, and what a lovely family! Such an evocative post. 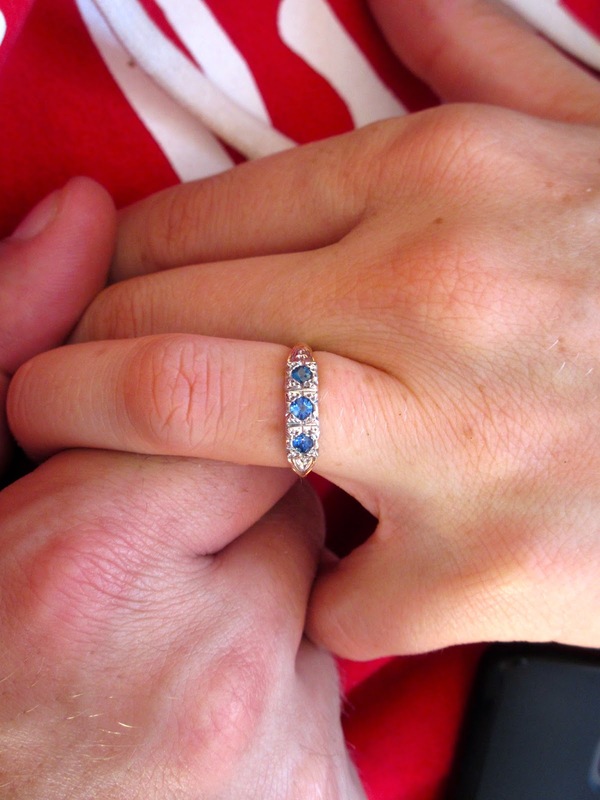 The sapphires to match the couple's eyes. The double flannel!